It’s been a long time coming. For one reason and another and I’ve been losing and gaining the same stone since I got my 7 stone award last August. For those who don’t know, I started my Slimming World journey in August 2012. I weighed in at 31 stone 1lb. I hardly left the house, I was having trouble breathing and had pain somewhere on my body everyday. I now weigh 23 stone 1lb and this time week I finally want to be able to say goodbye to the 23 stone category and hello to 22 stones! Once I can break through that barrier I believe it’ll give me the boost I need to start losing properly again. I’m 38 in 19 weeks and if I knuckle down and work at it, I can be at least 2 stone, if not 3 stone lighter by my birthday. Really, really good luck and well done for everything you've done so far, it's fantastic!! Congratulations hunny! You are amazing!!!!!! What an amazing journey you've been on. You should feel very proud! Good luck on your other goals. Thank you for sharing hunny. Oh wow! Well done you. It is fantastic what you have achieved so far! wow at 7 stone in one year! and really well done! that's really inspirational to hear how you have got on. 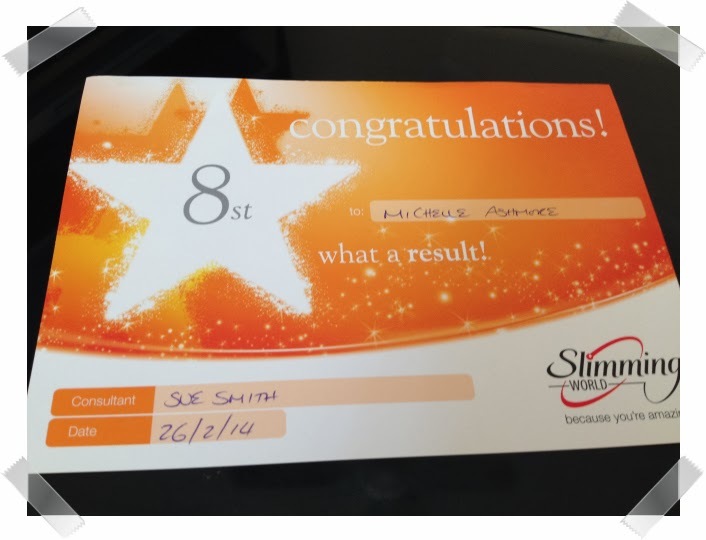 I need to lose a few stone myself, I found slimming world great when I did it before but I need to go back to it really – it's been 2 years now since I had my youngest and haven't got back to it yet!! !